DIDÁ ESCOLA DE MÚSICA (DIDÁ MUSIC SCHOOL) IS A CULTURAL INSTITUTION WITHOUT PROFITABLE ENDS THAT AIMS TO IMPROVE THE QUALITY OF LIVES THROUGH MUSIC AND THE ARTS. 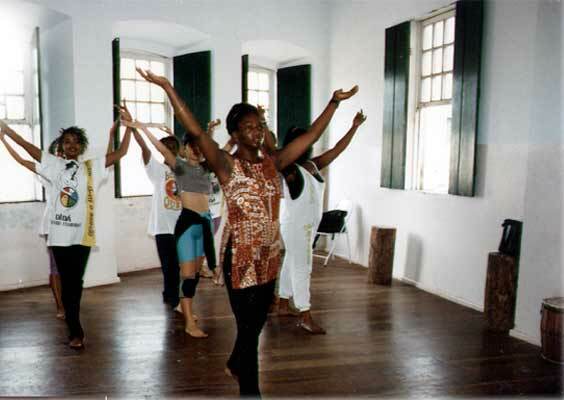 THE SCHOOL WAS FOUNDED ON DECEMBER 13TH, 1993, BY MAINTAINER AND MENTOR, MEASTRO NEGUINHO DO SAMBA. WITH HIS VISION HE CREATED A SCHOOL THAT INVOLVES SERIOUS EDUCATIONAL WORK AND IS BASED IN TRANSFORMATIONAL MUSICAL TEACHING. THE CLASSES THAT ARE OFFERED FOR THE COMMUNITY ARE: STRING INSTRUMENTS, WIND INSTRUMENTS, PERCUSSION, KEYBOARD, SINGING, CAPOEIRA, AFRO-BRAZILIAN DANCE THEATRE, ART, ENGLISH, AND COMPUTER LITERACY. DIDÁ IS A GROUP OF WOMEN THAT LOOK FOR THEIR GROWTH THROUGH MUSIC. THE MUSIC CLASSES OFFERED FOR THE WOMEN ARE FREE AND INVOLVE CONSCIOUS WORK. THROUGH THE COURSES THE WOMEN ARE GIVEN THE OPPORTUNITY TO BECOME EDUCATED OF THEIR ORIGIN, TO BUILD SELF-ESTEEM, AND WIDEN THEIR PERSPECTIVES FOR A BETTER FUTURE. AS WELL THEY RELEARN PRE-CONCEIVED NOTIONS ABOUT THEIR "PLACE IN SOCIETY AND ABOUT THEIR FAMILIES "PLACE IN SOCIETY. THE EXPERIENCE WITH WOMEN INVOLVED WITH MUSIC AND PERCUSSION IS VERY POSITIVE. 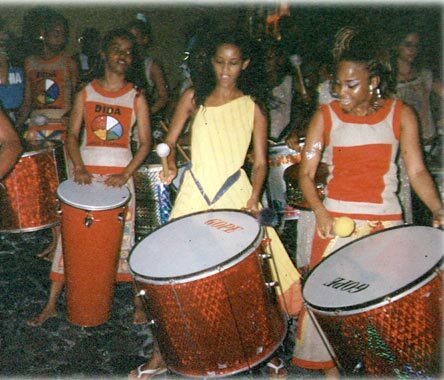 DIDÁ WAS THE FIRST WOMENS GROUP/BAND TO PLAY SAMBA-REGGAE IN THE WORLD. THE IDEA WAS BIRTHED FROM NEGUINHO DO SAMBA AND TODAY DIDÁ IS RESPECTED BY GREAT MUSICIANS FROM AROUND THE WORLD. Presently this project has more than 300 children enrolled and aims to create partnerships with the childs family and school. The childs family is also involved in all of the activities offered in the school. The family gets to participate in all of the activities and build a stronger support for their child. They have already formed a Mothers group that receives psychology sessions, cutting and sewing classes, crafting, as well as art and dance classes. Through this orientation the goal is to help mothers feel a stronger sense of responsibility, learn to grow love for their children and other children, as well to help create a big family where everyone "speaks the same language. One group of children sleep at the school and can only visit their families on the weekends. The majority of the kids contribute to making daily meals at Didá and have access to all of the courses offered in the school. Included in this project are practical contents of a normal school, however the staff at Didá teach with music and happiness making the classroom a pleasing atmosphere. The majority of the evaluations occur in the streets of Pelourinho, when the school has open activities, and they give the children the opportunity to explore and demonstrate what they have learned and share it with others. Bloco de Carnival was founded in 1994 by directors Neguinho do Samba, Viviam Caroline, and Adriana Portela. Included was the help and collaboration of their friends such as Vera Mercês, Mary Jane, Elite and others. Unfortunately only 200 women participated that year. In spite of the low appearance and participation of women, it was the year when women explored and discovered their avenue. That day they continued to play from Pelourinho to Campo Grande. They wore red overalls and yellow turbans, symbolizing and making reference to the gypsy woman. Suprisingly Neguinho managed to retrieve a strong trio (truck/cart) of sound that allowed for them to play loud and successfully that day. The block is going on its 7th year and was formed specifically for women, always including themes related to women: Anastácia, Tieta and Baiana de Acarajé (Bahian woman of Acarajé). In the year of 2000 the block grew and brought together the children, families and friends of these women that made a total appearance of 6000 people. If you go to Salvador, don´t miss to see a show of Didá. They perform every Friday night at 9pm at Praca Tereza Batista, Pelorinho.